We've all heard the moniker, that Disney is the "Happiest Place on Earth." What some people don't know is that it could easily be replaced with "Most Helpful Place on Earth." Okay, the phrase doesn't flow quite the same way, but you get the idea. And sometimes we need the help. Just because you cross into the "Disney bubble" doesn't mean that things don't go wrong. And maybe because we are on vacation in such an amazing environment those bumps in the road have the potential to really mess your vacation up. Now you may ask yourself, after months of planning, creating spreadsheets, reading travel guides, scouring the internet for every detail, what could you possibly need help with at Walt Disney World? Well, the short answer is, plenty. In 2008 I took my husband and two boys to Walt Disney World for our first family trip. On our first full day at Magic Kingdom we were sitting in Crystal Palace enjoying a delicious character breakfast. Ideal start to a great vacation week, birds chirping â€¦ the whole nine yards. So I ask my sons what they wanted to do first, already having an idea in my head of the possible answers. Thinking I would hear Splash or Space Mountain or even Big Thunder Mountain Railroad, I was pretty surprised when my youngest, Jason, piped up with "I want to meet Stitch." Okay, surprised doesn't cover it; completely floored was more like it. When did he develop this sudden interest in an alien who lives in Hawaii? Not only did I not see this coming, I didn't even know he knew who Stitch was. Turned out he and his big brother had watched the movie the night before we left, and he had a new hero. I have to admit, most of my prepping centered on rides, fireworks, and parades. None of the family had shown a particular interest in character meets and they had even scoffed at the idea of buying an autograph book. Now he wanted one of his first Disney memories to be a meeting with Stitch. This is where the cast member bailed me out. Our waiter at Crystal Palace, Robert, overheard this exchange and noticed me picking my jaw up off the table and jumped right in. He leaned over and explained that this was Jason’s lucky day. 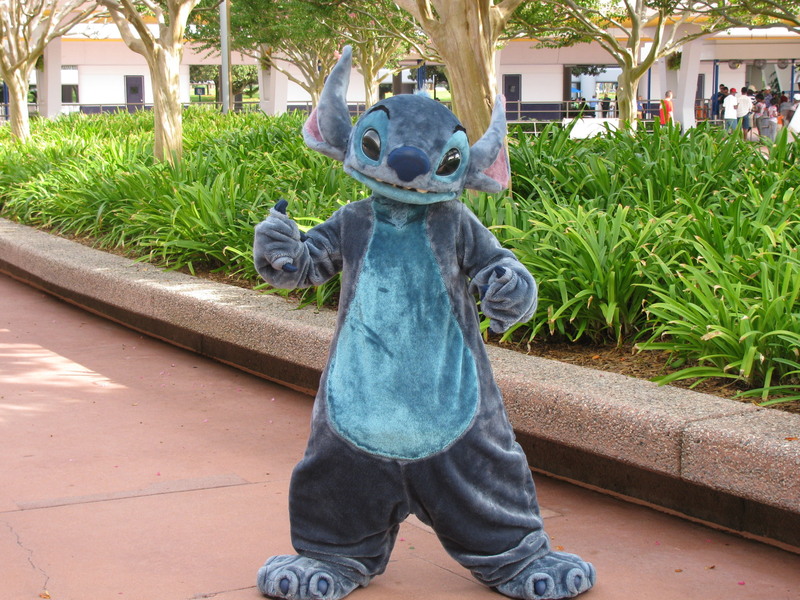 Stitch was scheduled to be in Tomorrowland this very morning and would love to meet Jason. Well, if Jason could have smiled bigger, I have yet to see it. Then Robert asked Jason if there was anyone else who was on his wish list. He got more out of my 7-year-old in 5 minutes then I had gotten out of him in 5 months of planning. And luckily with every character named, Robert told him exactly when and where to find him. It goes without saying that I was busy taking notes (Thank you PassPorter!). I wish I could say that the trip went along perfectly and we never needed cast member help again, but it wasn’t to be. Later in the week we had an Advanced Dining Reservation (ADR) for Tusker House for breakfast. We got to the park on time, even got to enter early since the ADR was before opening time. Once at Tusker House we had our picture taken with Donald and had the buffet tour. We were all returning to our seats when my oldest, Jeremy started crying. Now, for a little background. This was Jeremy’s Make-A-Wish trip, and he had just finished up cancer treatment. (Note: He’s 5 years cancer free and officially a cancer survivor!) So for him to cry generally meant something was wrong, not just that the potatoes were too salty. He explained that he needed to have the contact bandage on his eye changed, which helped his cornea heal, and it REALLY hurt. Our waitress, Kathy, noticed all of us upset and asked what was wrong. When we explained she grabbed a park map, showed us where the first aid center was, and arranged with the manager for my husband and Jason to stay at the restaurant and wait for as long as we needed. She even promised to get the characters to come by again when we returned. After a 20-minute trip to the infirmary we returned to our table to a smiling Kathy and fresh juice. We got our pictures with the characters and Kathy, and enjoyed our meal as planned. I’m sure we would have figured out where the first aid center was without her, but it helped to not have to search. And it made Jeremy’s day, as he didn’t miss out on anything because of the needed break. If I stop and think about it there were a ton of different ways in which cast members helped us out that whole trip. Another server gave us pointers on taking photos with the characters, and fun photo spots. A bus driver gave us great tips on where to watch the fireworks, and how to avoid mass exodus crowds afterwards. And don’t get me started on how great they were with pin trading tips. I didn’t even know there were completer pins for sets, let alone to be on the lookout for them. I guess someone could go on their trip with the idea that cast members are there to serve them and to do a job. But what we learned was part of their job involved speaking up and helping make our vacation the first of many to Walt Disney World. Stitch waiting for a hug. Valerie is both a professional quilter and attorney who loves visiting her happy place. She’s counting the days until her October 2014 trip.